Part of the show Naked on a Punt! Amanda - I work in an area called multi-robot systems. I deal with the development of algorithms that allow multiple mobile robots to operate in a coordinated manner. Georgia - Wow! So like a swarm of bees all moving and not crashing into each other? Amanda - In a certain sense, yes. Some people like to call this collective intelligence. Basically, the idea is if you have multiple intelligent entities communicating and cooperating with each other you can achieve things that are more than just the sum of the individual parts. Georgia - What kind of applications could you have for a system like this? Amanda - I think that traffic and transport is currently a very interesting application. There’s a lot that we can do to improve traffic as it is given today. I mean, you look at what’s going on on the river today and you see everybody just kind of doing their thing and we’re randomly avoiding other boats. Nobody has a clue of what optimal manoeuvre here would be and if we would just add a little bit of intelligence to this system we would probably be manoeuvring in a much more smooth, efficient, and actually also safe manner. Georgia - No offence Max. Amanda - No offence at all. Basically, you can think about how humans navigate traffic and there are two ways we do this. Either we have reactive behaviours, which is we, kind of, detect what’s happening around us. There are boats, vehicles to the left to the right, to the front to the back, and we either nudge a little bit to the left to the right, we brake or we accelerate. So that’s one manner. The other way we deal with traffic is in a little bit more of a deliberate manner. So I can see a boat coming from the front or I can see a boat coming on the left and I can try to make a guess or estimate about where I think that that boat is heading. And based on that I can kind of make a little bit of a plan towards where I want to head so that I will probably not collide with that other boat’s plan which I have kind of mapped out in my mind virtually. And so this kind of deliberative thing is what we can take many steps further if we actually add technology. So you can imagine that these boats here could be planning their paths all the way from the start to the end, to the goal, and they could communicate these plans to all the other boats that are in the vicinity, and you wouldn’t even have these manoeuvres that you see happening here because the plans are all laid out and they’ve all kind of smoothly negotiated how they’re going to be getting around each other. Georgia - What are the big challenges involved in systems like this either for punting or for cars. Amanda - I’d say there are two: one is scaling these systems up. 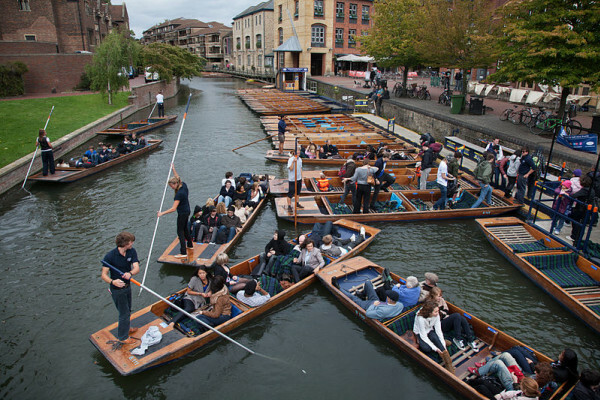 So obviously, if this punt or this boat here has a plan, where it wants to head, it’s not going to communicate this plan to all the other hundred boats on the Cam, so you have to decide whom you want to communicate this plan to. Obviously, communication bandwidth is one issue here and also computational resources are another. The other aspect is actually when we communicate our plans to other vehicles, we’re assuming that they will take these plans into consideration and they will cooperate with these plans. I’m saying I’m going to go this way, the other car will then try to find a path that goes around that path and not into that path. So we're assuming implicitly that everybody else is going to cooperate with us. This underlying assumption that everything is cooperative is somewhat of a strong assumption for two reasons. Other boats or other vehicles can be compromised maliciously, or other boats or other vehicles can simply break. The communications may suddenly not be up and running any more and so we can’t really ever assume that other boats are always receiving our plans and act upon them as we think or hope they would be. Georgia - Right. And no offence Max - don’t listen. But could we use technology and robots to replace our punter do you think? Amanda - It would be a very sad thing. Actually replacing the punter with a similar mechanical design is probably not the most efficient thing to do. You’d probably want to put a motor into the water that propels us forwards. If you would want to have some sort of robotic arm that pushes down into the water and hits the ground and pushes forwards. I do think that would be quite challenging because you need to have precise force feedback and I’m not quite sure what the sediment looks like at the bottom of the river, but I don’t think it’s solid. So this would involve sensing technology that is resistant or capable of functioning in those kinds of environments and able to give feedback. Georgia - So your job is safe for now I think. Chris - Amanda, can I ask you will I still be sitting in a traffic jam on the way to work if we implement your system? That’s what’s going through everyone who’s listening to this minds I’m sure. Amanda - Throughput and congestion control is one of the things that we can get rid of with more automation in traffic. And it’s not only about making cars autonomous, it’s also about connecting cars to people and deploying a ride sharing system where we’re better using the capacity of cars that can carry more than just one human driver. We can do this by implementing systems where cars are not actually privately owned any more but are similar to what we see happening with Uber and Lyft, being driven around cities in a shared kind of paradigm, and humans can just hop on and hop off on routes that coincide with the routes they would be driving normally with their own private cars. I think this is a much more efficient usage of the actual resources that we need to produce cars. It’s a better resource of real estate because cars don’t need to be parked anymore. So I think there’s a huge potential to improve over multiple dimensions here if we would implement such systems. What's the limit of human thinking power?